Virgin Australia has returned to the top of the punctuality table, edging out Qantas as the nation’s most on-time domestic airline, government statistics show. According to figures from the Bureau of Infrastructure, Transport and Regional Economics (BITRE), Virgin had the highest percentage of on-time arrivals in October, with 89.8 per cent of its domestic flights reaching their destination within 15 minutes of schedule. Qantas, which led all domestic carriers for on-time arrivals in September, slipped to second place in October at 88.3 per cent, followed by Tigerair Australia (85.4 per cent) and Jetstar (80.2 per cent). Among the regional carriers, Regional Express (Rex) was best for on-time arrivals at 87.9 per cent, ahead of Qantaslink at 86.9 per cent and Virgin Australia Regional Airlines at 83.9 per cent. The battle for on-time honours has been a see-sawing battle between Qantas and Virgin, with the two carriers swapping the lead on several occasions over the past year. Both airlines have placed a strong emphasis on punctuality in an effort to attract and retain customers, particularly those in the more lucrative corporate and government travel sector. 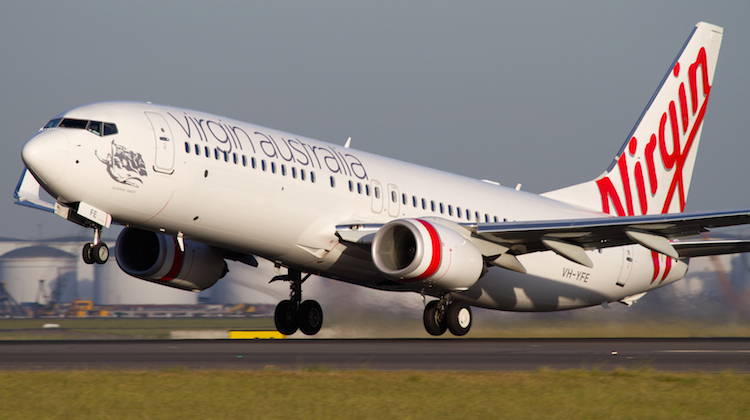 The BITRE report said the combined Virgin Australia/Virgin Australia Regional Airlines network had 88.8 per cent of flights arrive on time, while the Qantas/QantasLink network achieved a 87.6 per cent on time arrival rate. It was a case of double celebration for Virgin, which also had the highest percentage of on-time departures at 91 per cent in September, almost two percentage points ahead of Qantas at 89.1 per cent. And among the low-cost carriers, Tigerair was best for on-time departures at 86.8 per cent, well ahead of Jetstar which dipped to 76.9 per cent in October. Among the specific routes the BITRE report publishes statistics for, Canberra-Adelaide had the highest percentage of on-time arrivals at 97.3 per cent, while two routes – Perth-Port Hedland and Townsville-Carins – were the best for departures with 96.2 per cent pushing back within 15 minutes of schedule. In terms of specific airports, Ayers Rock Airport reported a leading 96.7 per cent on-time arrivals performance, while Port Lincoln Airport had 95.3 per cent of flights achieving an on-time departure.